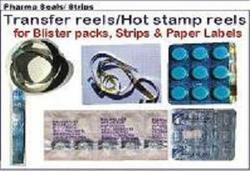 We are a leading Supplier & Distributor of Transfer Reels such as Hot Stamp Reels and GP Rolls from India. Our products are totally made up good raw materials. For achieving satisfaction level of our clients, our Transfer Reels are manufactured undern the guidance of our expert professionals. Besides, our range comply with latest market trend.